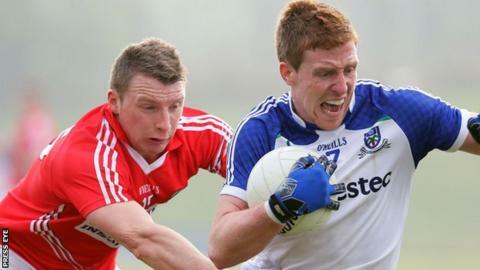 Monaghan fell to an agonising one-point defeat at home to Cork in Division One with Conor McManus missing a chance to secure a draw through a late free. Kieran Hughes scored a goal in the 22nd minute as Monaghan established a 1-6 to 0-8 interval advantage in Castleblaney. But two goals by Colm O'Neill saw the Rebel County get back on level terms. Scores by McManus and Paul Finley edged the Ulster men ahead again but a late point from O'Neill meant Cork backed up their opening win over Dublin. McManus was Monaghan's top scorer with nine points, eight of them frees. The result means Brian Cuthbert's men are the only team in Division One with maximum points after the first two rounds of fixtures. It was the first of four trips to Ulster for Cork in this year's league as they will also visit Tyrone, Derry and Donegal. Monaghan scorers: C McManus 0-9 (8f), K Hughes 1-0, P Finlay 0-3 (1f), C Boyle 0-1, F Kelly 0-1, K Duffy 0-1, D Malone 0-1. Cork scorers: C O'Neill 2-6 (0-5f), D O'Connor 0-5 (4f), B O'Driscoll 0-1, E Cadogan 0-1, B Hurley 0-1.